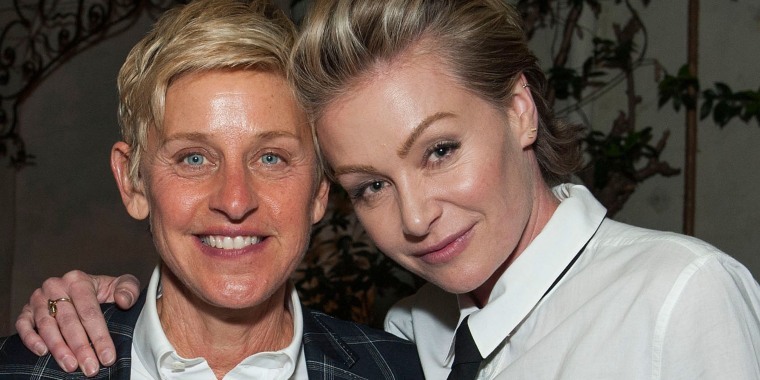 Ellen DeGeneres and Portia de Rossi just bought a $15 million home in Beverly Hills, California, and it’s got one of the most gorgeous outdoor spaces we’ve seen. Peeking behind the lush landscaping that surrounds the pool and covered patio is the city’s skyline — almost giving you the feeling like you’re on top of the world. And, well, with a house like this, you might feel that way already. With a fire pit, outdoor kitchen and other backyard perks, there’s certainly a lot to do outside. But inside is just as fun (and thanks to the large glass doors that can be opened up to the backyard, you can still feel like you’re outdoors even when you’re not). The living room features a cozy fireplace and wet bar with an area for the dining table — a perfect space to entertain all of the couple’s celebrity friends. In the clean, white open kitchen, there’s a large marble island, breakfast table and tons of natural light. The home was originally built in 1962, but has been renovated with modern features and the kitchen is one of the major upgrades. The 5,100 square-foot home has five bedroom and five bathrooms, and the master suite is the grandest of them all. With access to both a private courtyard and the pool, it features a spa-like bathroom and large closet. See more pictures of the stunning home at Hilton & Hyland.